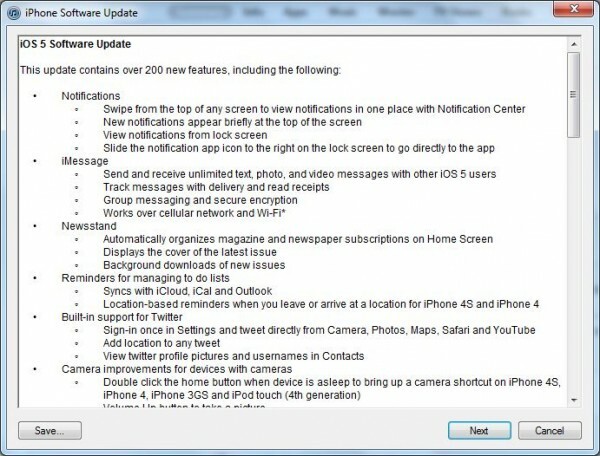 The most anticipated software update for iDevices, namely iPhone, iPod touch and iPad has been released at around 10 AM PST, October 12th, 2011, a date as promised by Apple. iOS 5 brings over 200 new features and enhanced functionalities to the iOS mobile devices, including the Notification Center, iMessage, iCloud support and PC Free, and it’s the prerequisite to enjoy iCloud. iOS 5 is now available for download and update directly through iTunes. There is no OTA (over the air) update yet. Only after upgrading to iOS 5 then the future update may be delivered via OTA. To get the update now, connect iPhone, iPad or iPod touch to iTunes via USB, and click on “Check for Updates” in the device’s information screen. iOS 5 is available for iPhone 4S, iPhone 4, iPhone 3GS, iPad 2, iPad, iPod touch (4th generation) and iPod touch (3rd generation).